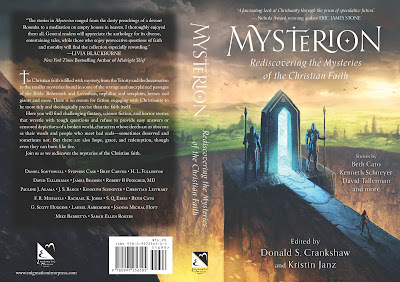 Mysterion is coming out on August 31st! That's the day that it will be available for purchase in both paperback and ebook from Amazon amd other retailers. Meanwhile, if you'd like to get it early, you can support us on Patreon. A $5 pledge will get you the ebook on July 29th, while $25 will get you both the ebook and the paperback, with free shipping, sent in early August. But you have to pledge by July 28th. After that, we'll be shutting down the Patreon campaign. Mysterion's full cover flat, for the paperback.